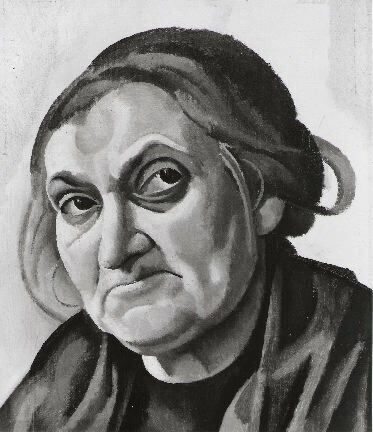 This portrait of William Roberts's mother-in-law, Cecilia Kramer, appears to be a detail that has been cut from the large work Jewish Melody of 192021. According to the notes in the National Portrait Gallery 1984 catalogue (p. 18), Sarah Roberts remembered selling a portrait of Cecilia Kramer to Edward Marsh for 5, and was under the impression that the work was the portrait exhibited at the National Portrait Gallery in 1984. However, it seems likely that it was in fact this work  known by the estate of Edward Marsh as Head of Old Woman  which was purchased by Edward Marsh, then being presented via the Contemporary Art Society to the Queensland Art Gallery in 1954. The work is incorrectly dated in the Queensland collection as having been created in 1957 (three years after it was acquired). PROVENANCE: Queensland Art Gallery, Brisbane (acc. no. 1:0739).